Ranveer Singh and Alia Bhatt shared a new picture on Instagram, giving us major "#mondaymotivation" goals. The "Padmaavat" actor captioned the picture, "Partner Goals #mondaymotivation," while Alia wrote on her post (with same picture): "Yaaaaaas... Monday motivation." Ranveer in his new mullet hairdo and Alia Bhatt in a pigtail posed funnily as they hit the gym. 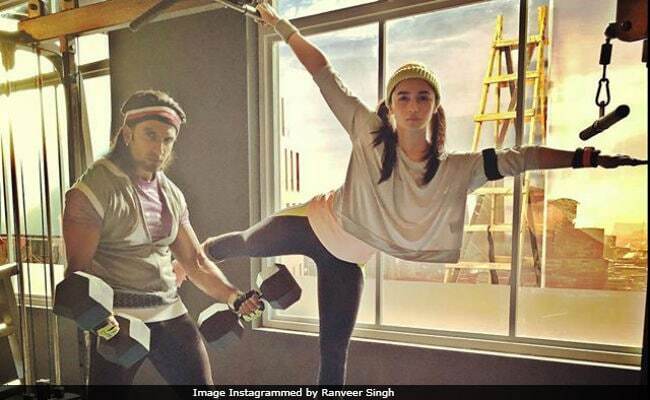 In the picture, Ranveer is seen holding a pair of dumbbells, while Alia is balancing herself on one leg. Gully Boy is Ranveer and Alia's first film together. This weekend, Ranveer Singh had unveiled the first look of the film and also announced the release date of the Zoya Akhtar-directed Gully Boy. Ranveer Singh, who impressed us as the power-loving Alauddin Khilji in "Padmaavat", went through an extreme transformation for his role in Gully Boy. Speaking about his role in Gully Boy, Ranveer Singh told IANS, "This is a story that means a lot to me. To tell a story of the youth from the streets of Mumbai, who live a very tough existence and have a lot of battle to fight and they in the battle of life they come out and triumph. They find their inspiration through music and art. The music that is socially relevant. So, it was important for me to also give a platform to all this new talent." Zoya Akhtar-directed Gully Boy, featuring Ranveer Singh and Alia Bhatt, will hit the screens on February 14, next year. After Gully Boy, Ranveer will be next seen in Rohit Shetty's Simmba, while Alia has Brahmastra, also starring Ranbir Kapoor and Amitabh Bachchan, and Raazi, opposite Vicky Kaushal, in the pipeline.